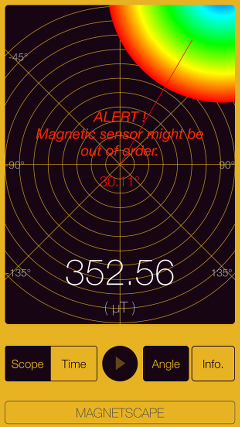 "Magnetscape" is a new measurement app that observe invisible magnetic fields by using a built-in iPhone magnetic sensor. There are various magnetic fields in our surroundings. For example, the magnetic field fluctuates even with a large motor, a compressor, or a metal nearby. Earth's magnetic field exists even in places where there is nothing, and we are affected by that magnetic filed. 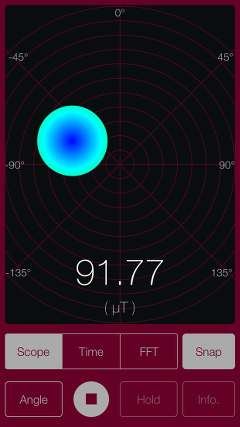 This app can monitor the surrounding magnetic field in real time, it can be used for various purposes in real life. For example, it can be used for investigation of static magnetic field, search for low electromagnetic field at alternating magnetic field (electromagnetic field), metal detection and more. "Magnetscape Lite" is a free edition that is simplified the magnetic analyzing tool, "Magnetscape". Please to click the following link to download "Magnetscape" from App StoreTM. It will be open the download page on App StoreTM. Please to click the following link to download "Magnetscape Lite" from App StoreTM. It will be open the download page on App StoreTM. Recommendation : Compatible with iPhone. Requires iOS 10.3 or later. iPod and iPad products are not recommended. 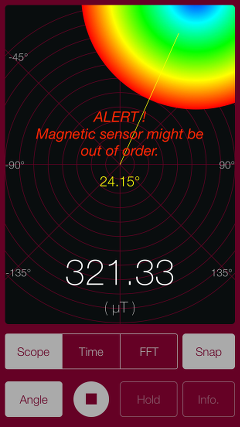 Alert function: A warning message will be displayed if the composite magnetic flux density exceeds 300 μT. Magnetic field is the space where the magnetic force is working, there are strength and direction because of vector quantity. For example, permanent magnets have N poles and S poles, those with different polarities attract, and ones with the same polarity repel each other's magnetic force in the space. Furthermore, the DC magnetic field is a magnetic field whose intensity is kept constant, there are geomagnetism, permanent magnets, etc. The AC magnetic field is a magnetic field in the case where the intensity of the magnetic field periodically changes, and it occurs near the transmission line, transformer and electric equipment. Such a magnetic field and an electric field are closely related, and it is also called an electromagnetic field in a low frequency region, also called an electromagnetic wave in a high frequency region. Also, where high voltage or high frequency current flows, a strong magnetic field appears around it. Magnetic field and electromagnetic waves are not directly visible to the eyes, so various phenomena and problems are overlooked. In particular, electromagnetic waves from electronic devices have various physical effects in some cases. 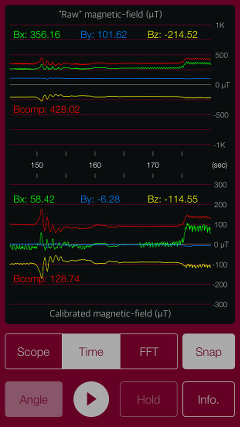 This app is a measurement tool for detecting such a magnetic field. It is possible to measure and display the strength and direction of the magnetic field, the time change of the magnetic field strength, FFT analysis of the triaxial synthetic magnetic field, etc. 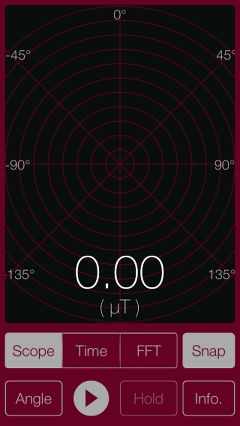 This app performs to measure and analyzes the magnetic field of the surrounding environment using the three-dimensional magnetic data from the built-in magnetic sensor of the iPhone. Upon the initial launch of the application, usage information in "Info" is displayed. Usage notes and explanation of functions are displayed. Please check this and use this application. Tap the Close button to return to the top view for measurement. 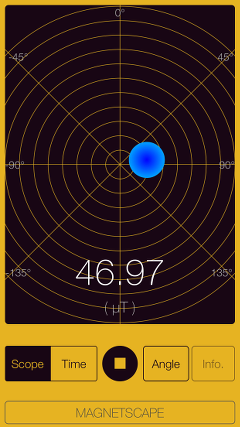 Tap the start button to start magnetic field measurement in each mode and stop by tapping the stop button. ALERT will be displayed if the displayed value exceeds 300uT during magnetic field measurement. The measurement will continue even then, but if a strong magnetic field is applied for a long time, the magnetic sensor may be disturbed. Magnetic field observation of this application is performed according to the terminal posture with the following data and conditions. 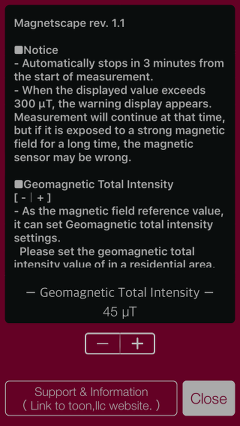 In Scope, numerical value of magnetic field intensity (unit: uT) is displayed, and graphic display of "Level circle" is made to show the magnitude and direction of the magnetic field. The display position of "Level circle" moves according to the polarity of the magnetic source, but if the polarity is in the same direction as the geomagnetism, it is attracted towards the north pole and conversely if the polarity is opposite (S pole) it moves away. "Level circle" will be displayed in the direction of the geomagnetism (north pole) (north direction) unless there is a metal or magnetic field generating near it. In addition, when you tap ”Angle" button, you can enable the angle display of the magnetic field. Time transition of RAW data from the magnetic sensor and post-correction data in the sensor is displayed. It is a time graph of each axis value (Bx/By/Bz) and composite magnetic flux density (Bcomp) in three-dimensional space. 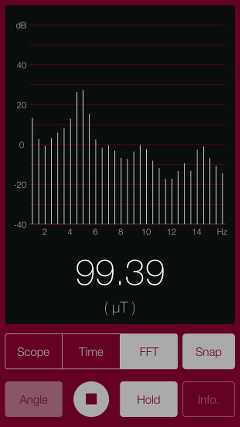 The vertical axis shows the intensity and the horizontal axis updates in real time with time. You can scroll up to 180 seconds. It performs frequency analysis by FFT for varying AC magnetic field. FFT analysis result of composite magnetic flux density is displayed in graph. By tapping Hold button during FFT mode measurement, the peak level of the FFT graph is held and displayed. 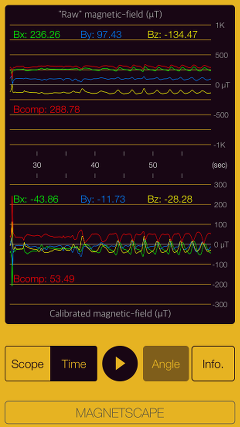 The maximum value of each frequency component can be observed. In addition, the signal strength of each frequency component is calculated based on the total geomagnetic field force. For terrestrial magnetism correction, please set the total terrestrial magnetism of your residence within the range of 45 ± 15 uT. By the setting in ”Info. ", you can set a reference geomagnetic total intensity. Reference: To find out the geomagnetic total intensity in your area, the following site will be helpful. By tapping "Snap" button, you can save the current measurement display to "Photos". When you save for the first time, confirmation of access permission to "photo" is requested from the iOS system. Please be sure to allow that access. By tapping "Info." button, it is displayed the product information link and the feature description. If you tap "Support & Information" or "Support/Info" button, Safari starts and you can see our support page. On "Magnetscape Lite", if you tap the "Upgrade info. ", you will see our App's information on the "App Store". By tapping "Close" button again, it will return to the previous measurement view. The display value of this application is the RAW output data from the magnetic sensor itself. It does not make any processing such as filtering processing inside the application. Since the magnetic sensor is a delicate device, the internal reference value of the magnetic sensor may be disturbed by being exposed to extremely strong magnets and magnetic fields for a long time. If the reference value of the magnetic sensor goes wrong, once you stop the application and leave it for a while, the magnetic sensor is readjusted automatically. If the magnetic sensor is still unstable, please try the electronic compass calibration and its reset procedure. Depending on the terminal model, it may take several seconds to 10 seconds for the measured value from the magnetic sensor to stabilize. Please send a review message for "Magnetscape". Please send a review message for "Magnetscape Lite".